Tibetan Blueberry is an evergreen shrub, terrestrial or epiphytic, about 0.5 m tall. Twigs are rounded, densely shortly setose, becoming, persistent bud scales few, oblong-lanceolate. Leaves appear to be 5-8-whorled, carried on stalks 1-4 mm. Leaves are oblong-lanceshaped, 3.5-5 x 0.9x1.4 cm, papery, hairless, secondary veins 7-11 pairs, spreading, base wedge-shaped or broad to narrowly rounded, margin plane, sparsely toothed, tip narrowly pointed to tapering, up to 1 cm. 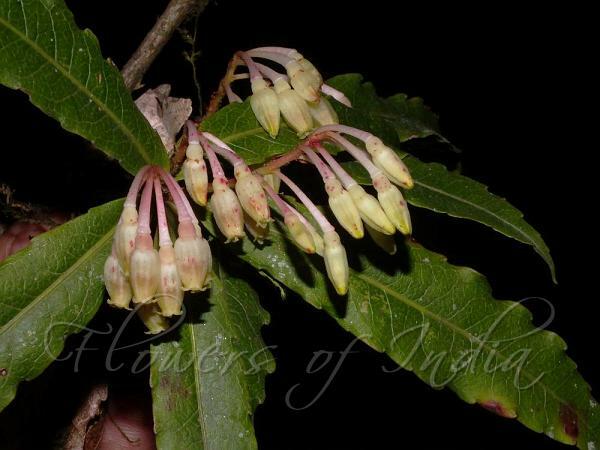 Flowers are borne in racemes or corymblike racemes, 1.5-6 cm, hairless or sparsely glandular hairy, with persistent bud scales, many flowered. Bracts are narrowly triangular, about 3 mm, falling off. Flower-stalks are 5-9 mm, hairless, thickened upwards. Sepal-cup is 1-1.5 mm, hairless, sepals triangular, about 1 mm. Flowers are greenish yellow, urn-shaped, 4-6 mm, hairless, petals about 0.6 mm. Filaments are 1-2 mm, anthers about 4 mm, without spurs. Berry is somewhat 10-chambered. 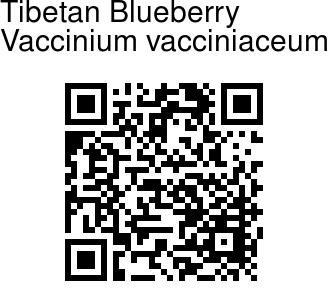 Tibetan Blueberry is found in Eastern Himalayas, at altitudes of 1200-2400 m. Flowering: April. Identification credit: Subhasis Panda Photographed in Darjeeling, West Bengal.